Stop in and treat YOUrself this new year with one of our great January 2016 Specials! Just in time for Valentines Day … you can now pamper a loved one with one of our gift certificates! See link on homepage or visit www.rivenailandskincarespa.com/gift-certificates to buy yours today. 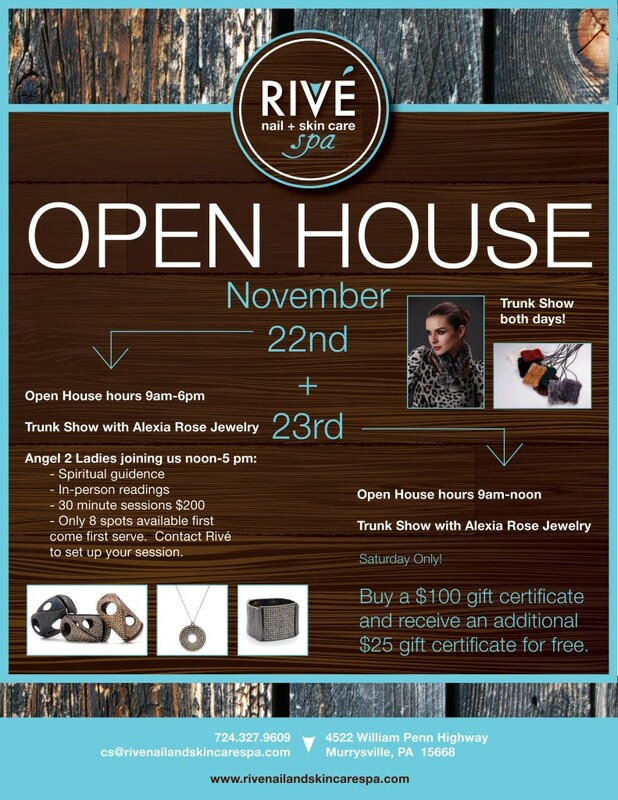 Join us November 22nd and 23rd for our next Open House. Bamboo Firming Fluid from our Eminence Handmade Organic Skin Care line, is one of our best sellers. With results like these, it’s no wonder; *Skin appears tightened and firm in as little as 5 minutes *Collagen levels increase by 25% in just 6 days *Wrinkles and crows feet dramatically soften in 28 days. If you haven’t tried it yet, stop in and get your sample. We are so excited to be adding massage to our list of services! Choose from Swedish, Hot Stone, Deep Tissue or Pregnancy Massage. It’s not too late. You still have time. Stop in and get your Mother a wonderful gift certificate for Mother’s Day. Don’t forget, now’s a perfect time to book her Celebrity Day at Rivè. Make her day even more special by booking your Celebrity Day along with her. Pamper her and yourself with a manicure, pedicure and facial. Looking forward to seeing you soon! In light of the latest bashing last week on the talk shows about gel polish applications, we want you to know that we at Rivé are ALL about preserving the health of your nails and skin. We use the LED lights instead of the UV lights to apply our gel polish systems. Many refer to the gel polish applications as ‘Shellac’ much like many call a Band-aide a Band-aide, despite the many other companies that make band-aides. So is the case with the gel polish systems. Shellac was the forerunner of the gel polish applications. However, there now are many, many companies that make gel polish. Here at Rivé, we work with four different companies which enables us to customize the perfect union between your personal body chemistry, and the gel polish application. That’s correct…unless you are going to the ‘discount salons’, and having the same acrylic which is used to repair boats and teeth applied to your nails, it’s all about science, body chemistry, and conscientious work when applying the more healthy nail applications. It takes much more heart and mind. We love what we do at Rivé Nail + Skin Care Spa and we want you to feel the same way! Rivé Has A New Look! Rivé has a new look but same great service.